GETTING YOUR CHILDREN to sit down and eat a healthy meal can seem like an impossible battle sometimes. According to child and adolescent psychotherapist Colman Noctor, it doesn’t have to be that hard and the best thing parents can do is not worry about it too much. Speaking to TheJournal.ie during our parenting Q&A this week, Noctor responded to a question from a concerned dad who had trouble getting his 5-year-old boy to eat his dinner. This is an issue that can become an unhealthy obsession for parents, rather than children, the expert explained. His first piece of advice is to try cutting out snacks completely for a few weeks to re-establish a routine around meals – don’t even keep any in the house. My mum used to always say hunger is a great sauce and so the child needs to be hungry. Allow a child to be a bit of a fussy eater; we all don’t like everything and there are adults my age who have Brussels sprout trauma because they were made eat this thing because it became really important. And we know that through neurological studies that being forced to eat something can have an association right through your childhood all the way up. The main message here for parents with reluctant diners is to back off. On top of this, you can try making the meals more playful or creative but never cook different meals for different children. It can make a big different for a child if the whole family eats together but remember that 20 minutes of sitting still is a long time for someone who is only five. “I you’re trying to do that and your mealtime lasts 45 minutes, the child is going to get agitated and bored and once they pass that threshold of being engaged you’re actually fighting a losing battle to keep them there because it becomes a power of wills or locking horns,” Noctor explains. When this happens, do not allow them to play around the dinner table area. If they don’t want to eat any more that’s fine and they can leave the table and go into another room. “What you’ll find is that they’ll gravitate back because they want to be around you and the food is that thing or that communication that allows them that engagement,” Noctor said. Parents can often be outsmarted by their little ones and the mind games they play, he added, but it is not about creating an “us and them dynamic” in the household. To sum up, try cutting out snacks, diluting the intensity of meal times, encourage them to eat what they can and try to camouflage the good stuff. Watch the video above for more parenting advice from Colman. He also deals with a lot of these kinds of issues in his book ‘Cop On’. Email “Are your little ones fussy eaters? Here's how to make dinnertime feel less like a raging battle”. 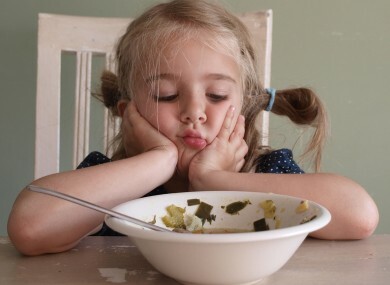 Feedback on “Are your little ones fussy eaters? Here's how to make dinnertime feel less like a raging battle”.